It was the voice. That deep, strong, confident, almost mesmerizing instrument he used so well. That’s how he courted me in 2009. It worked. It wasn’t the first time I’d heard it but it was the first time I’d heard him in that way. It changed a bit, it softened, but without losing it’s power. I’d known Eric for nine years. My ex husband and I and Eric and his late wife, Karen spent a lot of time together from 1999 to 2004, when they improbably landed in Iowa, where he’d taken a job as a news director after years in the radio business in Austin, Texas . When Karen became terminally ill, we traveled to Austin, where they had returned, to see our dear friends, to give moral support to Eric and Karen’s daughters, and to say goodbye to her. It was 2006, and I remember leaving their house in tears as I couldn’t imagine a world without my friend Karen. Over the next years, we heard from Karen’s daughters, but from Eric, not a word. We both hoped he was doing well. In 2009, the “we” became a “me”. When you clear out a relationship, you find yourselves clearing out closets and drawers as well. One day, I ran across a piece Eric had written about my late father and his sudden passing. It was an unusually sensitive piece, reminding me that the rather moody and taciturn man did have a big heart and a keen intuition. Eric’s intimidating brilliance and his native New York kind of brash didn’t always work for people, both on the air and off, here in the friendly Mid West, but he never scared me. I could see through him. I e-mailed him. He hates e- mail. Three days later, one line…”give me your number, I’ll get in touch.” He got in touch. He loved the phone, that’s how he communicated, that’s how he made his living for so many years. Our conversations, in the beginning, took the tone of an interview. Eric specialized in interviews. He’d spent on air time with everyone from Jimmy Carter to Robert McNamara. No one intimidated him. Not only did he know what he was doing, but he grew up in Manhattan in a show business family. If he was interviewing me, it worked. We married in 2011. Eric was born in Manhattan in 1952, the son of Stephen Blumberg, who worked in the costume business, and Patricia Bright, an actress and comedienne. 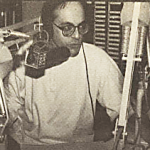 He grew up listening to what he considered among the best radio talk show hosts. Barry Gray of WMCA, and Barry Farber of WOR were particularly favorites. “They were conversationalists, it’s not talk, it’s conversation,” he says about them. In those days radio talk show hosts weren’t the overwhelmingly partisan voices that held up the views of one side or another to an adoring choir. They had conversations about issues with just about everyone. In 1980, he moved to Austin on a fellowship to graduate school in Journalism, and became a teaching assistant. 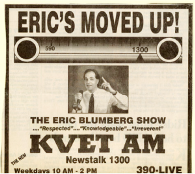 When he was more than midway through, he was offered his first job as a city reporter for KLBJ. It was then he decided he wanted to do what the “Barrys” in New York did….have a conversation, on air, and with just about everyone, like them. Plugged in....his favorite place to be then. He stayed on the air for many years, developing a solid following and winning multiple awards and being known for his knowledge, his tenacious questions, and thorough research. He was particularly known for his strong interviews with a variety of people and a variety of topics. 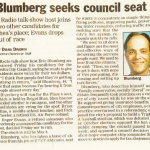 He ran for city council, confounding both conservatives and progressives with his takes on many issues. He couldn’t be pigeonholed, and in those last days, things had started to change. You did better on one side or the other. The business began to change along with the increasingly partisan audiences, and the Rush Limbaugh type was gaining listeners and gaining ground. Eric had strong opinions, but they were his own. There didn’t seem to be a place for his kind of talk. He headed out and headed north to work as a news director in Sioux City. 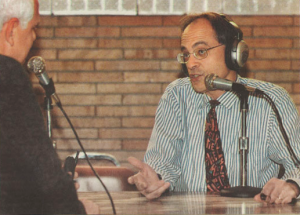 He told me once that driving up to Sioux City, he knew “his career (as he’d experienced it), was over.” He spent nearly 5 years working for a very conservative station, first as news director, then as a talk show host. It was 2003, a tricky time to be on the air, particularly when you felt the upcoming war in Iraq was a profoundly bad idea. He was summarily fired the day the war broke out, one of hundreds of journalists across the country that didn’t survive the growing groundswell of excitement over “shock and awe”. He never held a microphone again and didn’t look back. Eric, having suffered depressions in his life, put his energy into advocating for the mentally ill, and now teaches. Strangely, he’s now married into a family that owns multiple radio stations, including talk radio, but those stations still follow the partisan model. 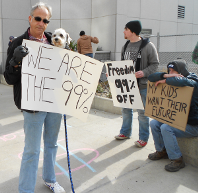 He still has strong opinions and isn’t afraid to let anyone know where he stands. The pre dinner hour in our house, when I’m cooking and he’s watching Chris Matthews, or flipping to FOX news for “the other take”, is essentially the “Eric Blumberg” show. His new rant is a common one. Climate in DC is abysmal and he doesn’t hold out much hope in this “coin operated”* political landscape. His rant is smart, it’s hilarious and I hear more of him than what’s coming out of the kitchen tube, which is fine with me. But… it’s an audience of one, not thousands. *Ted Waitt comment on politics these fine days. So, the voice. The voice that captivated listeners for 20 years, and the voice that won the heart of this writer is needed right now, I tell him. He’s starting to write again, starting to find the voice, and threatening some interesting new projects. I hope so. I’m very lucky to hear that voice, and I hope that someday others can too. It’s time. Eric, we’re the same age…that’s a plus as I know it’s never too late. When I go to my favorite spot, and ideas for short stories from my youth start coming faster than I can write, I remember what it was like to get a story published. Not a Philllip Roth novella, or a blockbuster screenplay, but a short story about an eight year old girl, me, winning a pony in a drawing at Montgomery Wards in Crawfordsville, Indiana. You allow people to think… form their own ideas. They may not know it, but that’s what happens when writers sit down and spill out words, which in turn become reality for the reader, and satisfaction for the writer. And in some cases, inspiration for the next first time award winning author. Amor Towles- RULES OF CIVILITY. He doesn’t know it, but he got me writing again… And so it will be with you. Thank you Cindy for letting us nudge a bit. Look forward to buying your book Eric. I first met Eric and Karen while working for Senator Harkin. I always enjoyed visiting with them both and getting to know them. I have always admired Eric for his candid views and his not being afraid to voice his views and opinions. Happy Birthday, Eric! And, many, many more! It would be great to hear you again broadcasting! Eric says thank you for your kind comments and nice to hear from you!